Memphis went from having few (if any) bicycle lanes in 2008 (when we were named Worst City for Bicycling by Bicycling Magazine) to nearly 200 miles of lanes today. And we got an award for Most Improved from that same publication in 2012. So it's fitting that Microcosm Publishing's traveling Dinner + Bikes tour is making a stop in Memphis on Wednesday, May 20th, at First Congregational Church. The event is being hosted by Revolutions Bicycle Co-op. 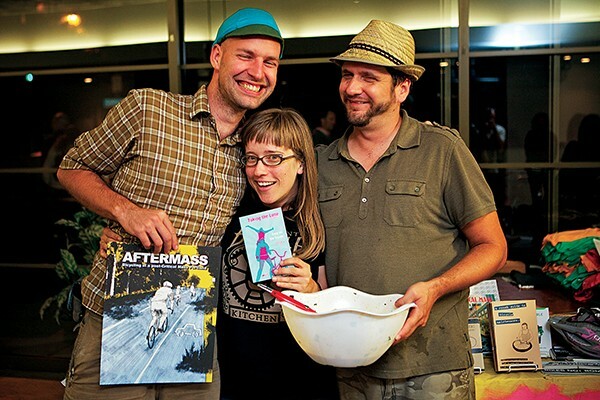 Joe Biel (founder of the Portland-based zine publisher Microcosm) and Elly Blue (author of Bikenomics: How Bicycling Can Save the Economy) will present eight short films about bicycle equity and social justice. And vegan chef Joshua Ploeg, who has published numerous cookzines through Microcosm, will serve a locally sourced vegan dinner. The films range from two to 12 minutes in length and cover everything from the evolution of bicycle advocacy to a profile of a bicycle superhero from Mexico City. "He is a luchador of the streets. He pushes cars out of crosswalks, helps people cross the street, and paints bike lanes and crosswalks where he thinks they are needed. And he wears a mask and a cape," Biel said. Biel said, since the tour stopped in town last time (in 2012), he's aware that Memphis has made a ton of progress in making cycling more accessible for all. "I know, from looking at the numbers, that the city of Memphis has learned tremendously in the last five years," Biel said. "The statistics of your ridership are up 500 percent, so it's definitely a great strategy for your city. It's working." After the presentation and dinner, there will be a sale of Microcosm's zines, and Ploeg will sign his new cookbooks — This Ain't No Picnic: Your Vegan Punk Rock Cookbook and Superfoods for Life: Cacao.